YESTERDAY, THE CONCEPTS of single- and double-sleeve-valve automotive engines were discussed. Today in Part 2 we’ll focus on the Scottish Argyll marque, the high point of which came between 1910 and 1914. Classic Cars in Profile: Volume 3: Profile Nos. 49-72, Anthony Harding, general editor, Doubleday and Company, 1968. 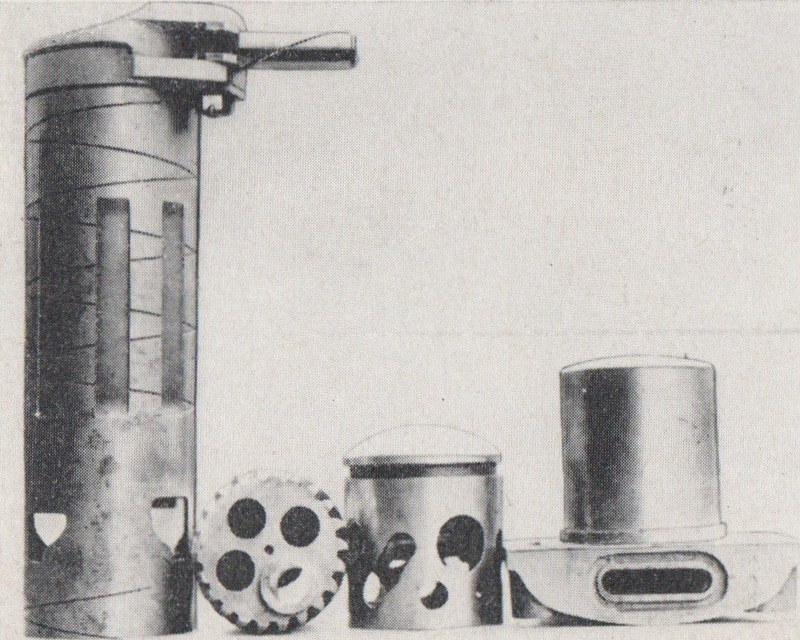 Argyll innards: a sleeve (inverted), a valve-actuating gear-wheel, a well-pierced piston, and a combustion head (inverted). 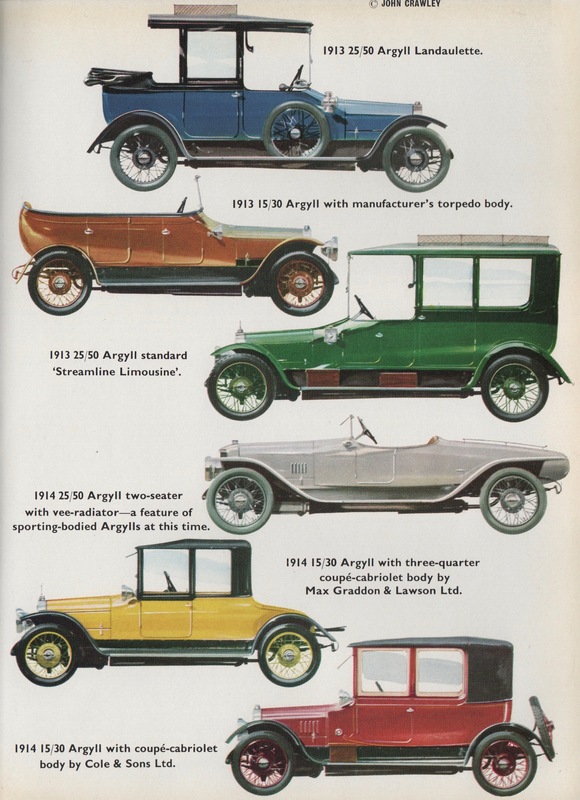 This and the following images from Classic Cars in Profile, Vol. 3. Argyll Four-Wheel Stopping. 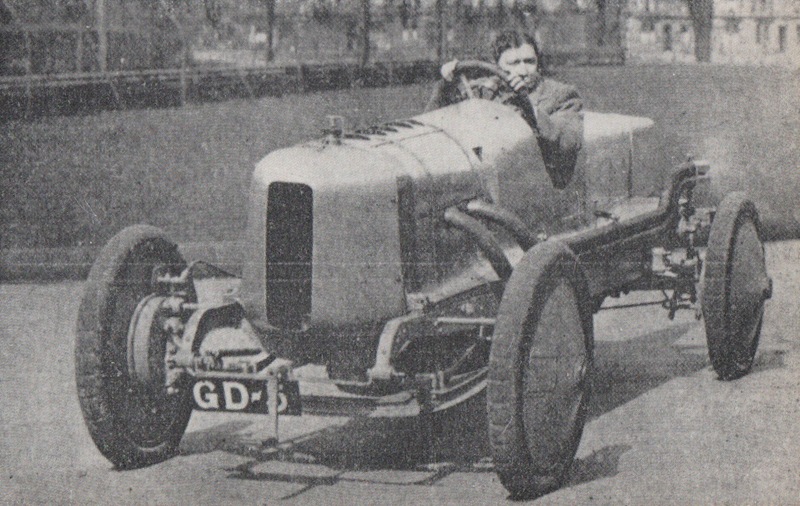 In 1914, Argyll chief engineer Henri Perrot acquired rights to a rarity at the time: four-wheel braking. Actuated by cable through either the pedal or hand brake, the braking had diagonal compensation and worked reliably in minimizing side-slip (a common hazard of rear-only retardation). Argyll Records at Brooklands. 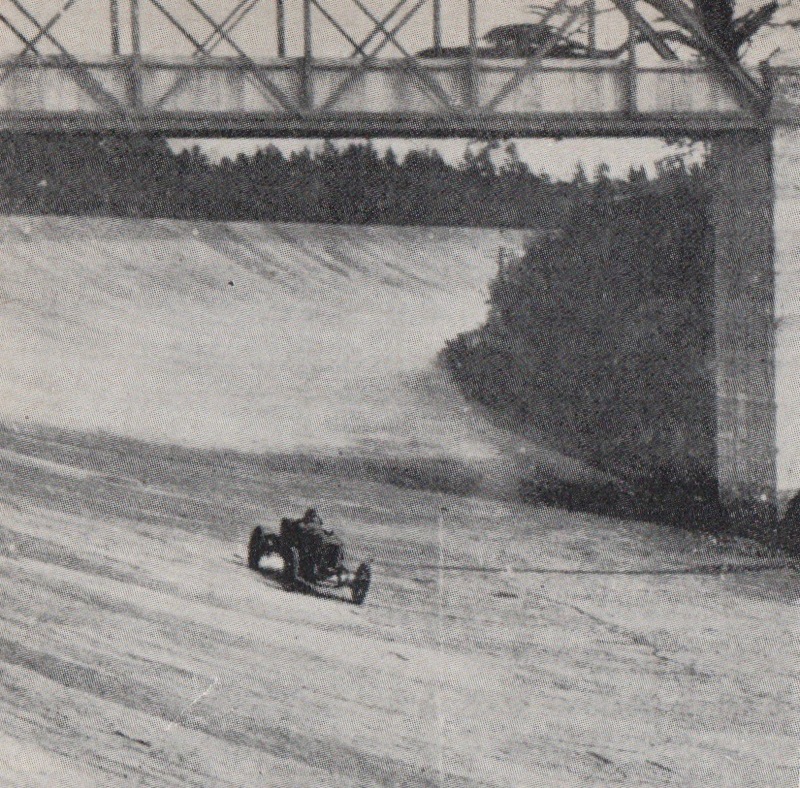 In 1913, a streamlined Argyll 15/30 was taken to the Brooklands Circuit, the plan being to run for 12 hours. Matters went so well that two more hours of lapping were added and no fewer than 26 records were set. A Brooklands pit stop. W.C. Scott, the works driver, is replaced by L.C. Hornsted. The pit staff is overseen by chief engineer Henri Perrot. The Argyll passes under the Member’s Bridge at Brooklands, May 19, 1913. Demise, Yet Vindication. Argyll never recovered from a change of management in 1914. The factory suffered from overcapacity in the 1920s, made its final appearance in the London Motor Show in 1927, and ceased operations completely in 1932. The magnificent single-sleeve Bristol Hercules 14 cylinder twin row radial designed by Sir Roy Fedden was an intriguing power plant. There are some animations online that are simply memorizing to watch, like something a bunch of Swiss watch makers would introduce and perfect. The Bristol Beaufighter acquired the nickname “whispering death” on account of her sleeve valve engines. 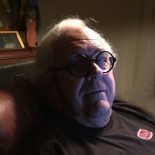 Denis…thank you for the many hours of pleasure I’ve received from your blog. Grey, Thanks sincerely for your kind words. My Dad, shortly before he passed on in ’91, told me he served a short time at the Argyll Works as an apprentice draughtsman in the late ’30s as the place was gearing up for possible wartime production. It did, producing tanks and armed personnel carriers. By that time Dad was mustered into the RAF, considered too tall to fit in fighter aircraft and assigned to various convoys as a ship engineer, working steam turbines. He was so thrilled to have worked there, albeit a short stint, his first real job after Draughting school. The Argyll Works languished after the war, gutted except for the massive facade entrance and was eventually developed as a shopping center. When I visited it in the early ’90s, there was a small Scottish Automotive Museum in the basement featuring models of Argyll cars. The Works faced what I was told was the former estate and grounds of the founder and owner. Thank you, Gordon, for filling gaps in Argyll history. And also for your kind words about the website. Daimler held a Royal Warrant for automobiles from 1896 until 2008. Smoky or not, the Royal 1910 Daimler Limousine by Hooper currently resides in the Petersen Automotive Museum in Los Angeles. When it left the Royal Mews (The Royal Family doesn’t just have a “garage.”) it was acquired by Willys, who had the inscription “Owned by His Royal Majesty, King George V of England” lettered in gold leaf on the windows and used it in promoting the sleeve valve engine. The car is seven and a half feet tall, so unless you are permitted to visit the Museum shops, you never see it. It won’t fit through any door in the Museum proper. 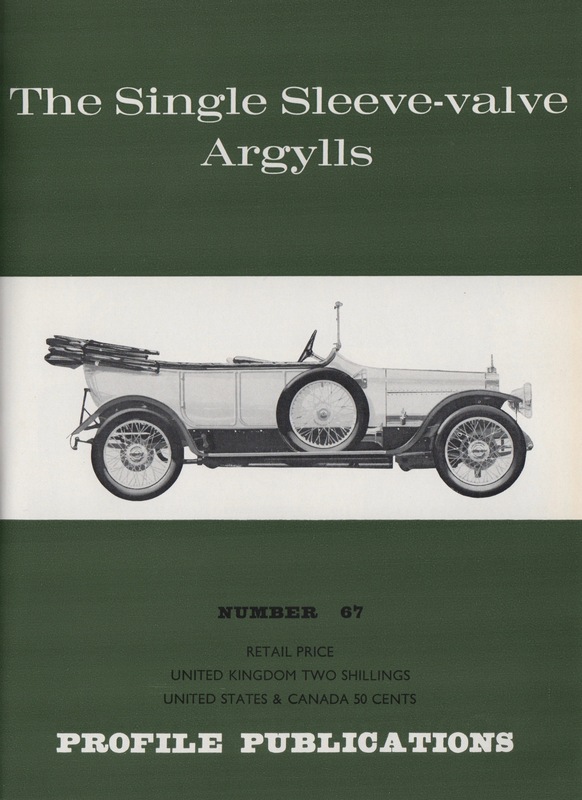 This entry was posted on February 14, 2019 by simanaitissays in Classic Bits and tagged "The Single Sleeve-Valve Argylls" George A. Oliver in "Classic Cars in Profile Vol. 3", Argyll Brooklands record run 1913, Argyll four-wheel brakes 1914, Bristol single-sleeve-valve radial aircraft engines.